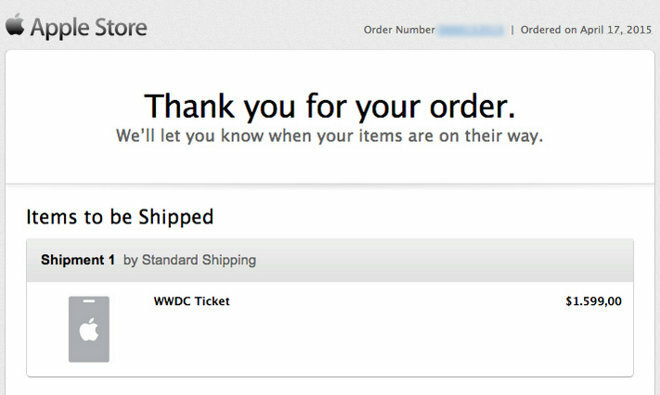 Apple on Friday began sending out Worldwide Developers Conference 2015 ticket confirmations to lucky developers who were selected at random after registering to attend the annual event scheduled for June. As seen in the image above, posted to Twitter by iOS developer Robert Neagu, Apple's WWDC 2015 lottery process is underway after registrations closed earlier today. Confirmations are going out to developers around the world, though some found out they were accepted through credit card charge alerts. Conference passes cost $1,599. WWDC is expected to highlight iOS 9 and OS X 10.11 in a keynote, more than 100 technical sessions and hands-on development labs. Over 1,000 Apple engineers will be on hand to answer questions and guide third-party developers through the software building process. For 2015, Apple announced it would live stream the keynote and a number of tech sessions for those who can't attend. Earlier this week, Apple said it would offer 350 scholarships to promote STEM (science, technology, engineering and math) learning for students and members of groups representing tech industry minorities including women, blacks, and Latinos. WWDC 2015 is slated to run from June 8 to June 12 at Moscone West in San Francisco. Developers who registered to attend should know the status of their application by Monday, April 20 at 5 p.m. Pacific.